Welcome to C.Y.R. Viasur S.L. 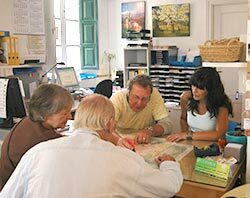 A Travel Agency specialising in Rural Tourism in the province of Granada, the Lecrin Valley, the Alpujarras and surrounding areas. Our Team is composed of some 30 people who look after the houses in their charge to ensure they are maintained to the high quality as set down by the company. To add to this team are Sandra, Mª José, Carmen and Ron who man the office where you can visit us and receive advice on anything you may wish to know. Our Office can be found in the pretty village of Melegis, in the heart of the Lecrin Valley (Granada) in the Plaza Eduardo Rebollo Aranda, directly in front of the church. Additionally, you can contact us through our website or by phone +34 958793667 / +34637517523. Our experience: Having spent more than ten years dedicated to rural tourism, we have aquired a wide experience in this sector which we put at your disposal..
Our “Value-added”: We carry out the maintenance on the majority of the houses and rural accommodation which we rent out and know each of them personally. This enables us to help you in your choice of house or rural hotel and to let you adapt your search to ensure you to have an enjoyable holiday in surroundings in which you are happy. Our information: On our website you will find information about your chosen area. The accommodation, natural environs, routes (walking or architectural) gastronomia of the region, events (folklore, sporting, religious,…) customs and traditions. You can enjoy direct contact with nature, take part in the local social scene or simply rest. To take and place reservations in rural tourist accommodation, taking careful and complete attention to detail to ensure the clients needs are met. Collection of information about rural activities which are not damaging to the environment and the dissemination of that information to clients wanting to participate in those activities. Collection of information in regard to the gastronomy of the region and the dissemination of that information by offering details of restaurants which offer the same. Collection of information and publicity material related to rural tourism in the area which complement Viasur´s rural tourism ideal, and the dissemination of that material to clients staying in our accommodation. This includes information about the environment, routes (walking, gastronomic, architectural,…) events (religious, folklore, events, sports,…) and authentic customs and traditions. Our associate company: VIASUR S.L. specialises in the sale of houses and land in the area in and around the Valle de Lecrin. If you decide that you would like to buy a house or land, you can contact us on our other website: www.lecrinvalleyproperty.com where you can find anything from a ruin to a newly built house, or a piece of land where you can enjoy the weekends in the countryside. If you would like to contact us we can arrange an appointment where, after a consultation as to your wants we can view the houses or land in which you have expressed an interest..
Further to you visit, we can offer you the possibility of getting to know the Lecrin Valley by video Lecrín Valley and allow you to enjoy the environment of orange and lemon trees to be found here, and see the areas where the land and houses we offer are situated. Our activities are subject to the supervision of the Director General of Tourist Planning, a public organ under the Council of Tourism and Sport of the Junta de Andalucía. Our philosophy: “know what to offer and to offer the best to our clients." We offer personal treatment and promise to help you enjoy quality rural tourism. In Viasur we are always searching for ways of offering total satisfaction to our clients by way of our services. This means a promise on our part to work hard to offer a personal service and to allow our clients expectations to be met. By cooperation and mutual respect with collaborating companies we hope to reach all of our stated objectives, so that our clients receive the best attention and service possible. We base ourselves on the Multi-dimensional Model of Btrady and Cronin (2001) which measures the quality of Travel Agencies, see article. The Client: “The client evaluates (their experience) on multiple levels and finally combines these evaluations to arrive at an overall perception of the quality of service”. Laura Martinez Caro of the Politechnical University of Cartagena. For this we have to listen to what our clients are saying and quickly tailor our service to meet their needs and preferences. We also need to evaluate and consider the needs of our collaborating companies. We are continually working with our collaborators to train in new technologies, legislation and trends to enable us to offer a rapid and personalised service. We and our collaborators have to continually review and revise all accomodation and complementary services which we offer to ensure our quality continues at the established level. In Viasur we choose the products which we offer with care as the market differs in quality and we must at times personalise products to mee the needs of our clients. Continuing communication with our clients is the basis of our service. At each level of the booking process we maintain contact and continue to do so until the process is finalized. All client requirements are established in writing to ensure that Viasur provides the service needed. We base the efficiency of our service on the prior removal of possible errors and the ability to resolve any problems which may occur. We are always looking for a high level of client satisfaction, giving great importance to the perception of each and every client as regards to the service we offer. One of our prime objectives is to give the best possible service to our clients so that they are always satisfied with what we offer. This ongoing attention to the client helps us to improve all that we have to offer. In Viasur, our Travel Agency specialising in Rural Tourism, we can make reservations for your annual holiday, weekends away or short breaks in any of the accommodation which appears on our website. Restaurant reservations. We can also help you to find the restaurant of your choice in the area. Internet connection (for flight confirmation, E-mail, Internet etc...). All of these servicies are offered by Viasur and our collaborating companies whose common characteristic is the promise of quality and personal service. All this is to enable you to enjoy direct contact with the nature of the area and let you be part of the social environment of rural life, or to simply relax and disconnect from your daily routine. If you wish, you can contact us and we will respond within 24 hours, or simply phone 958 793 667. In either case we can help you choose what is best for you. Thank you for choosing us. Publish your house on our website. Rent and take care of the general maintenance of your house. Below is a breakdown of what we offer. From the first contact by the client we make sure that we listen to the clients needs and ensure that they receive what they are asking for. Publication of the house, rural accommodation or hotel on our website as well as with other travel companies with whom we collaborate. Publish the details of your house on our website in two languages; take of photographs and formatthem for the website, write a detailed description of the house and give its location..
Place information books in two languages prepared by ourselves in each house, giving information that clients need for an enjoyable stay. Take and coordinate reservations by way of the Viasur website. Inform the owner of bookings taken and coordinate the same. Finally, we make a small one-off charge to place your house on our website, which includes the taking of photographs and translation. This is over and above the normal commissions charged for managing rentals. 9 Photographs of the property with the posibilty of a photo gallery. In our website you can also find information about the area and the village in which yourf house is located as well as the complimentary rural activities available. If you are the owner of a property or of a rural tourism company which offers services similar to those published on our website, you can link with us, or simply call us on +34 958 793 667. We will then contact you and together we can help raise the level of business. If you are the owner of a property in the Lecrin Valley area or its environs and are not permanently occupying your property, we can look after the property for you and ensure it is maintained in peak condition. Cleaning and maintenance of pools. Manage the connection, reconnection and updating of telephone services, electricity, water and gas. Solve problems with public service providers. Pay taxes to local councils and the Deputation in Granada. Prepare insurance policies and take credit/debit card payments. Provide, acquire and arrange deliveries of goods. Translation of documents or other material. Organize and manage minor works and renovations. Arrange quotes, supervise works, check completion of works, check and pay final bills. If you are the owner of a property and would like to contract any of our services that we offer, you can contact us, or simply call on +34 958 793 667, and we will call back within 24 hours. Our associate company VIASUR S.L. specialises in the sale of houses and land in the area in and around the Valle de Lecrin. If you decide that you would like to buy a house or land, you can contact us on our other website: www.lecrinvalleyproperty.com where you can find anything from a ruin to a newly built house, or a piece of land where you can enjoy the weekends in the countryside. If you would like to contact us and we can arrange an appointment where, after a consultation as to your wants we can view the houses or land in which you have expressed an interest..
Further to you visit, we can offer you the possibility of getting to know the Lecrin Valley and allow you to enjoy the environment of orange and lemon trees to be found here, and see the areas where the land and houses we offer are situated. "In compliance with the Data Protection General Regulation (EU) 2016/679 of the European Parliament and the Council, on the 27th April 2016, we inform you that the provided personal data will be processed by PMA VIASUR S.L. with VAT number B18397216, addressed in MELEGIS (GRANADA), C.P. 18658, PLAZA EDUARDO REBOLLO ARANDA Nº 7, to provide the requested service, and make the billing of it.